which include a 15 gallon Gas Kart. This plastic gas caddy is more than just a storage solution, it’s your pal! This unit boasts big benefits in a small package. With dimensions of 13” D x 11” W x 33 ½” H, it can be stored without taking up a large amount of space. The eleven (11) gallon capacity offers the right amount of fuel for quick and easy refueling of generators, mowers, and even boats! 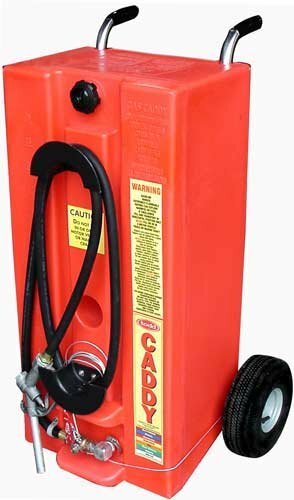 These plastic gas caddies are designed for easy maneuverability with a molded-in handle and recessed wheels. The standard six foot hose is gravity-fed, so no pump is needed, and equipped with a brass shut-off valve. Take the “Gas Pal” home today for the beginning of a long friendship! 13" x 11" x 33 1/2"